Hm...OK. What's that? I hit another site and didn't see it. Weird. Ok, View-Source then, what drives you little blue thing? Ah! I totally get it. Excellent. I shall make my own immediately! I added this file to my website and added a <link> line as seen in the first example above that pointed to it. I wonder if it works in IE7? Pow! I wonder if Live.com supports it? IMPORTANT NOTES: Make sure you include the first line of the XML file (the XML declaration) or IE will ignore it and nothing will happen when you add it. Also, make sure you include the default XML namespace or Firefox will give you an error: "Firefox could not download the search plugin"
This feature is one of the best hidden "secrets" of modern web browsers. I have several providers; such as search for a MSKB article, a hotfix, event-id etc. I still tell people about the orange down-arrow in IE7, which appears next to the search field when it finds an OpenSearch provider, and they get amazed. It was only a few months I told some of your colleagues here in Sweden about that at a search seminar held at the Microsoft campus. I think Live Search USED to support opensearch discovery, many many design iterations ago. It was that and IE7 that supported it first as I recall. IMO its worth investigating the many other features of OpenSearch. aL: IE7 and Firefox2 were released 6 days apart - so IE only just beat Firefox. Yet, Firefox's implementation has more features (not least the favicon). OpenSearch is great, and so easy to implement - I wrote a provider for our product in my lunch hour, handed it over to the dev guys (for real coding - error handling, an all that boring stuff.. ;-) and the PR we got was incredible. Also, integration with MS Search Server and SharePoint comes free!! We run OpenSearch on our site www.brownbook.net, works really well in Firefox, but seems to have defaulted Atom stylee for IE, I will need to do a bit more digging... anyone know why? Which will give you that awesome auto-suggest you see with the "out-of-the-box" Google provider in FF. I use it all the time. BlogEngine.NET have had it implemented since version 1.0 over a year ago. It's one of those things that gives a wow-effect when people discover it and it is so easy to implement as you also demonstrated above. 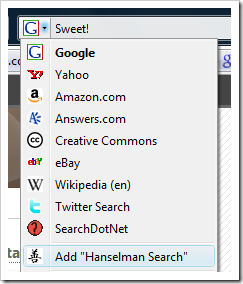 In Opera: right click on any search field. 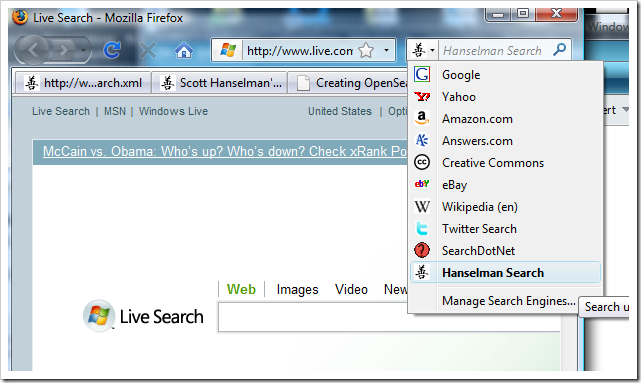 Now I can go "S OpenSearch" in my address bar to search on scott hanselman's site and search for Opensearch. Or use the search engine search box like other browsers have. Or select a word in a webpage, rightclick and go "search with Scott Hanselman"
Although I like that there is a standard for it for developpers to give some way to customize it, I think it is a bit redundant seen previously mentioned technique has worked for years without any effort from the devoloper. What's more interesting than setting up OpenSearch for internet-facing sites is adding your INTRANET search engine and make it the default! As far as I know, no one's really doing this, despite how easy it would be to implement. So there's a thought: use this for your intranet. Note that you can add more than one open search in your site/blog. I did it in my blog (see for yourself). For you Firefox fans you can use Add to Search Bar 1.7 Firefox Extension to add any search on any website to the search bar, even ones that do not have the code described in this article. Hi I would like to mention another search engine for dot net developers which cover all good sites for dot net and related technologies as of August, 2008. This developers search engine is inspired by searchdotnet.com and I try my best achieve even batter results. Both these developers search engines would greatly help the developer’s community. DO test it yourself and let me know your comments.